Anyone who knows me will know that my favourite time of year is autumn (that’s the fall, to our American cousins). Not only do we get crisp, sunny days, Guy Fawkes Night and the overwhelming urge to drink red wine in cosy pubs again, we also get Halloween – the best time of year for baking. The UK didn’t really celebrate Halloween in a big way when I was a nipper in the 80s – only in more recent years has the commercial influence from the US hit these shores, bringing with it a host of Halloween-inspired goodies. Considering that when I was young, there was only one type of witch’s hat available throughout all the shops in and around London (a flimsy black and orange disappointment, unlovingly crafted from cardboard), the selection available now is immense. However, in our house, we always made an effort for Halloween. Not that I wish to paint my close relatives as some sort of modern-day Munsters, but we always dressed up and had some kind of Halloween nibbles. 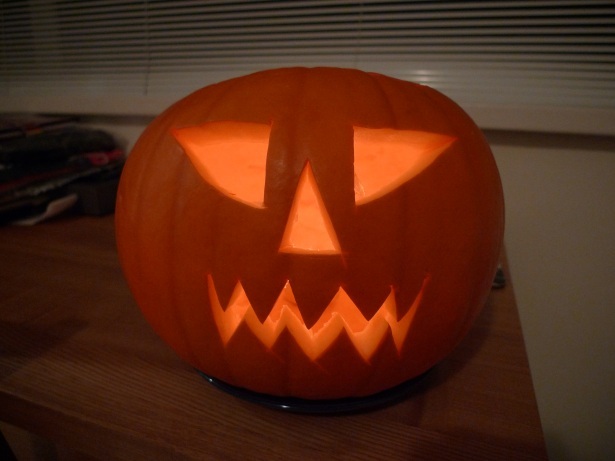 Pumpkins weren’t widely available in the UK back then, so we used to have a lantern carved out of a swede instead (a tradition handed down from my South African gran). Nowadays, there are pumpkins aplenty in the local supermarkets which opens the door for plenty of seasonal recipes, as do the cans of Libby’s pumpkin that I stock up on every year through www.americansweets.co.uk. This entry was posted on 17/10/2010 at 6:37 pm and is filed under Seasonal food with tags Baking, Food, Halloween, Pumpkin. You can follow any responses to this entry through the RSS 2.0 feed. You can leave a response, or trackback from your own site.